Eileen Rudisill Miller who is known to almost everyone as “Rudy,” is an accomplished illustrator, product designer and painter whose works have been shown at Moore College of Art and Design, The Woodmere Art Gallery, The Franklin Mint Museum, The Tyme Gallery, and The PA Guild’s Center for American Craft. In 2002, Miller began her home studio business, E.R.MillerDesigns. Her decorative product design work has resulted in numerous giftware collections for clients such as Lenox, Henri Bendel and Harrod’s Department Stores, Bath Body Works, Party Lite and The Bradford Group. Miller’s business has grown to include her online greeting card store, and her Etsy shop that features original paper dolls. She has illustrated a wonderful collection of Princess, Mermaid and Fairy themed children’s activity books and paper dolls for Dover Publications, and has become well-known to paper doll collectors internationally. Her paper dolls have been printed in magazines such as Faerie Magazine, Paper Doll Studio, Paperdoll Review, Paper Doll Circle in UK and S Moda in Spain. 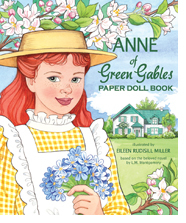 Anne of Green Gables is her first book for Paper Studio Press. Miller is a co-founder and officer on the board of The Haverford Guild of Craftsmen. She lives in Havertown, PA, with her husband, Jeff, and their 2 sons. She posts artwork on her Facebook page every Friday and invites you to check it out at facebook.com/E.R.MillerDesigns.